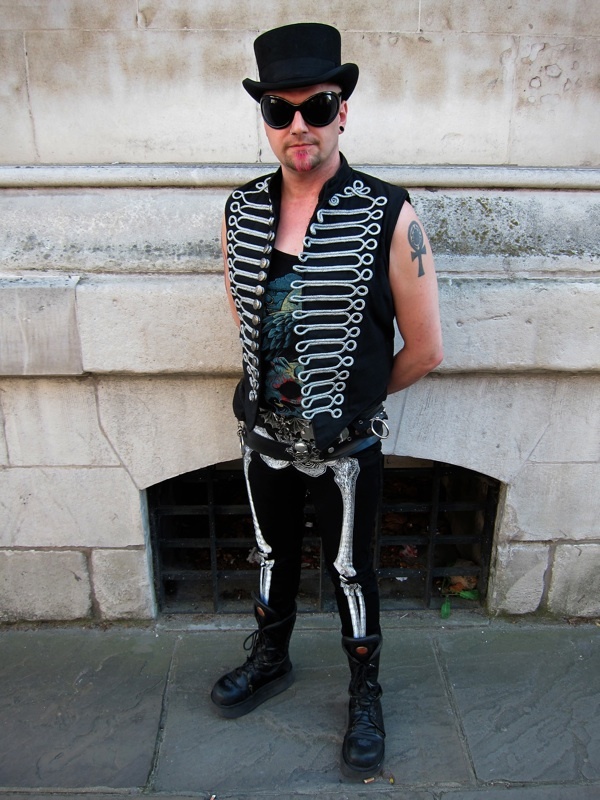 In spite of what you might assume, Kallistratus Wraith, Pirate Goth Magician & Corsetier, was given his name at birth. “My parents were quite eccentric, they christened my elder brother and sister Arachnid and Grendel, so as soon as they were old enough they went to a lawyer and changed their names to July and John – but I like my name, I think it suits me,” Kallistratus admitted. “It means dweller from the deep, that’s why I have this,” he added, pointing to the octopus tattooed on his brow by means of explanation. You may have seen Kallistratus – widely known as Kato – and his wife Pip in the streets of Spitalfields over the past year, looking strangely at home in their fearsome goth outfits among the old buildings, as if the entire neighbour had been constructed as some extravagant steampunk fantasy and they were creatures that had emanated from its deepest recesses. “She’s a rockabilly goth whereas I am more a piratey goth,” Kato informed me helpfully, exercising his lilting Herefordshire accent, and opening my eyes to the precise distinctions of gothdom. 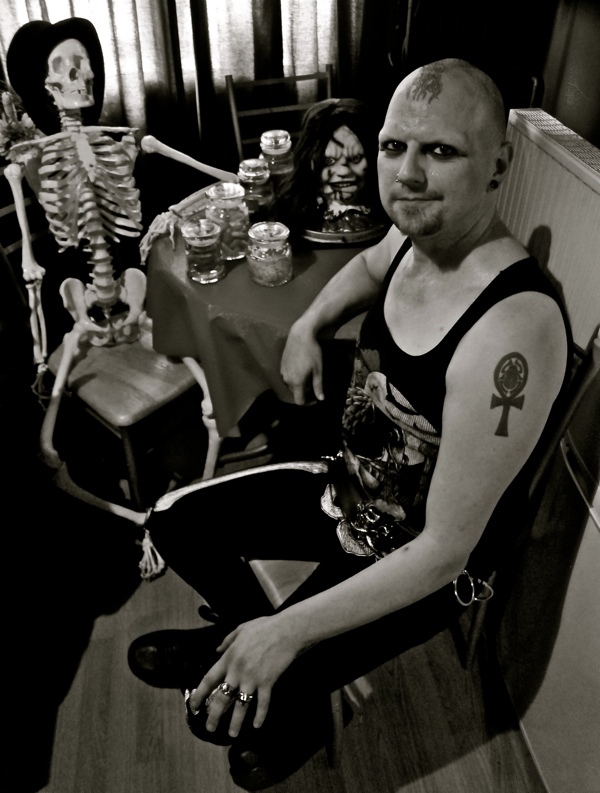 “Pip and I met at a goth club, filled with goths gathered together. We already had our goth styles and we were both types that we both liked. So that was part of the attraction and we were more or less married twenty minutes after we met. At the time, Pip was living in a shared house with friends that she didn’t like and I was living in a house on my own, so we went down to get her things that night and she moved in with me and that was eighteen years ago. We came here when our friend opened her goth shop, we worked for her before when she had a shop in Camden. It was ten years ago we met Sam, Pip worked for her at first but then she had an accident and broke her leg so I went in to help her out in the shop and the customers seemed to like it. I am a magician, I do magic acts and stage shows but when I am not doing that I am the corsetier in the shop, I measure the ladies for their corsets and fit them for their corsets. I love to seeing women in corsets and I’ve always been interested in Victorian styles. Even when I was a little kid, I used to have long black painted fingernails at school and long black dyed hair. My dad was a magician and he collected old props and we used to have a skeleton in the front room. This was in Herefordshire. He died when I was ten and after that I wanted to do magic for him, to carry it along. I went to stay with my step-father who was my father’s best friend who was also a magician and lived in the Hollywood Hills in Los Angeles for many years. Kato invited me to visit his tiny purple flat in Whitechapel that he shares with Pip. Stepping into the half-light of the living room, where sunlight filtered through closed curtains I could distinguish three sinister figures lurking in the gloom, life-size animatronic figures of familiar villains from horror movies. Yet Kato stood between these hell-raisers and extended his arms affectionately to introduce them to me as his cherished companions. 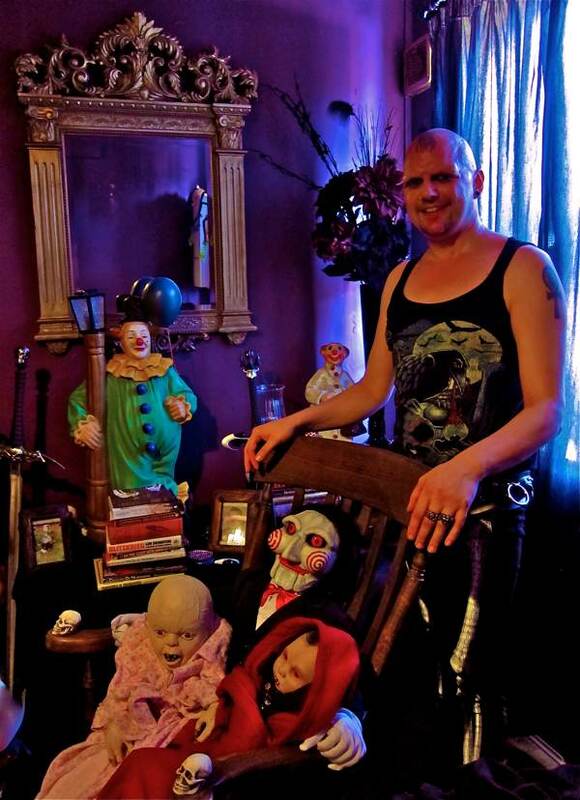 Elsewhere in the room, horror babies nestled upon a rocking chair, a disembodied head lay upon the table and a skeleton presided over all, just as it did in Kato’s childhood home. Kato told me that he used to perform magic at London fetish clubs but they have tailed off with the recession and he is looking forward to returning to the Holllywood Hills where the culture of goth horror magic remains vibrant. Kato delights in these transgressive areas of culture where the collective unconscious becomes tangible and, for him, the past is not something over and done but a continuum in which we can participate through our daily actions. Entirely comfortable with dark areas of human experience that fill many with dread, Kato retains an upbeat courteous manner and is an engaging advocate for the seductions of fantasy. The ideal corsetier. 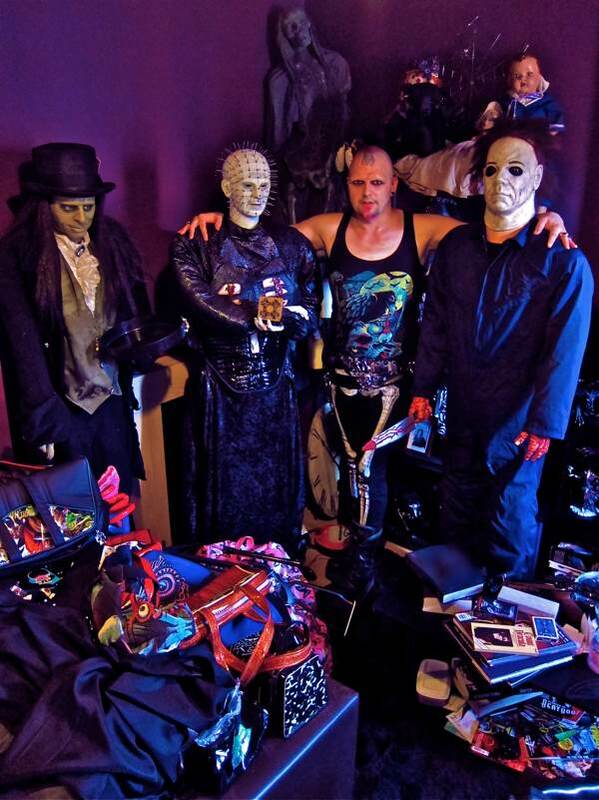 Kallistratus at home in Whitechapel with his animatronic moving horror figures. A cosy corner of the living room. Kallistratus Wraith, Pirate Goth Magician & Corsetier. I had a great time doing this interview . ouf. i am lying on the floor with all four paws up. good one, ga.
love the story of how he and his wife met. I had a reading from Kato at Toni’s shop in Gloucester and he was really good. Would love to have another reading but don’t think he is there any more.